Sonia Simone: This episode of Copyblogger FM is brought to you by Digital Commerce Summit. We’ll be telling you more about this amazing live event later in the show, but check out Rainmaker.FM/Summit for all the details. That’s Rainmaker.FM/Summit. This episode is brought to you by Acuity Scheduling. Acuity Scheduling makes scheduling meetings online easy. Clients can view your real-time availability, self-book appointments with you, fill out forms, and even pay you online. To learn more and get a free 45-day trial, visit AcuityScheduling.com/Copyblogger. That’s AcuityScheduling.com/copyblogger. Hey there. It is good to see you again. 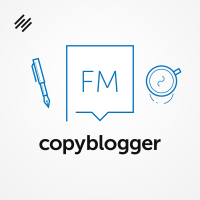 Welcome back to Copyblogger FM, the content marketing podcast. Copyblogger FM is about emerging content marketing trends, interesting disasters, and enduring best practices, along with the occasional rant. My name is Sonia Simone. I’m the chief content officer for Rainmaker Digital, and I like to hang out with the folks who do the heavy lifting over on the Copyblogger blog. You can always get additional links and resources at the show notes, which you can find at Copyblogger.FM, along with the complete show archive. This week I am reading a book by Shawn Coyne, business partner and longtime friend of Steven Pressfield, the heavy-hitting book and story editor. He has a new book out called The Story Grid based on his very interesting blog and very interesting podcast of the same name. Coyne’s book is all about structure. I’m really interested in writing structure, and the reason is, I have seen over the many years that I have been putting words together that structure is really what makes writing work. It’s what gets what’s in your head, the emotions that are in your head or the ideas or the points of view, and puts them into a shape that someone else can get them into their head. Structure really is what makes it all work. I’m always interested in a big book on structure. This is probably one of the bigger books on structure since Robert McKee‘s book, Story, which is required reading for screenwriters, but actually also very interesting for anybody creating content or other kinds of persuasive and interesting material for the web. One of the things that I think Shawn Coyne adds to the conversation is he talks a lot about genre. And genre, of course, more traditionally means things like is it a mystery novel, is it a romance, it is science fiction, is it fantasy. He makes the argument, and I think his argument makes sense, that pretty much any kind of commercial writing will fall into a genre. Some of them we think of as being genre, like science fiction, and some of them we think of as being non-genre, like literary fiction or serious historical fiction or nonfiction journalism. He makes the point that all of these fall into the category of genre. Because for him, a genre is very simply a promise made to the audience — a certain set of expectations that is set with the audience so that they can pick up the kind of work that they’re in the mood to consume at that time. He includes realism as a genre, and it’s a component of genre. He breaks down different components. There are soft genres, funny genres. There are hyper-realistic genres, and then there are more fabulist fantasy kind of genres. Every once in a while, a writer will open up something new. I think you could make the argument that George R. R. Martin really created something that was new. Or if not created, popularized something new by taking fantasy and combining it with a brutal, very gritty realism. George R. R. Martin’s stories, as over the top and violent as they are, you can see some parallels with actual history from the Middle Ages. It’s kind of, what if fantasy novels were as violent and difficult and bleak as some of the worst periods of the Middle Ages were? And you get George R. R. Martin. These are ideas around fiction, around novels and short stories and plays, so why mention them in the context of content and content marketing? It really comes down to audience expectations. I think that’s where Coyne has really zeroed in on something here that merits a closer look: setting and meeting, hopefully meeting in a really compelling way, a set of audience expectations for the kind of content you’re creating, whether it’s a short story or a novel or a blog post or a tutorial video. The first alarm bell that gets rung, or the first question that gets raised where people are a little uncomfortable, is this idea that if I have to shoehorn what I’m doing into a genre, then doesn’t that destroy my creativity? Before we get started, I want to address this. In my experience writing fiction, writing nonfiction, writing content — constraints do not diminish creativity. In fact, typically constraints will advance your creativity. What this kind of structure does, when you understand the structure of what you are trying to create — the effect that you’re trying to create for a specific audience with a certain set of expectations — when you can see the structure, it’s actually very liberating, because if there are problems, you can get to the point where you understand that it’s a structural problem. It’s not because you are an essential failure as a human being. And as writers, we do tend to go there fairly quickly. I thought Coyne had a rather interesting quote on that: “You as the writer are not the problem. The problem is the problem.” In other words, your content, taking it back to content marketing, is not working not because you’re a failure as a human being, or all the places we go in the dark hours of the night. It’s that the structure is off, or the execution has not hit the mark. And both of those are things that can be addressed and improved. If you’re going to write a murder mystery and nobody got killed in this murder mystery, that wouldn’t be very much fun, assuming your audience is older than about 7 or 8 years old. Trying to write a mystery story where there’s no discovery of a body is leaving something out of the equation, and the expectations are going to be disappointed. From there comes this idea — it’s certainly not unique to Shawn Coyne, but he talks about it a lot — of the obligatory scenes. I would have, if I were him, given this a more palatable name. Because as soon as we have this idea of an obligatory scene or an obligatory content type, we immediately rebel. It’s like, “I don’t work for you. I don’t have to write your obligatory scenes.” It’s loaded. Let’s try and unload that, and try and look at it dispassionately. The concept behind these is simply that if your piece of work doesn’t contain this material, then the audience expectations are not met, and the audience leaves your content disappointed. When we are talking about content that supports business or a project or a nonprofit, or tries to get people to take some form of action, this kind of content also has what we could call obligatory scenes. It’s all about meeting the expectations of your audience and moving them where you want them to go. Since the expression ‘obligatory scenes’ is getting a little bit weird and awkward, I’m just going to talk about pages or elements of your website. Now, I’m not going to throw every one of them in here. There are a couple I’m not going to go into in detail. For example, your About page. Please put an About page on your website, and please tell me something about you, the creator of the content, on the About page. I can give you a link with more on that. Again, that idea of the obligatory scene or the obligatory element — when your site doesn’t have it, your audience wastes all kinds of time looking for it. I can’t even tell you how often I find interesting content that’s been shared on social or I find it through a search. And I can’t find who wrote it, and I can’t get some information about that person and their context. This really diminishes the experience of the content. So the About page I would say is an obligatory element. I will just give you a link to that. I won’t go into it in depth here, because I’ve covered it elsewhere. I’m going to paint this one in somewhat broad strokes today. We talk a lot about more specifics on this kind of content on the Copyblogger blog. That is definitely the place you want to be if you want to dive deeper into specific kinds of content. But the first one, broad brush, that I’m going to talk about today is audience attracting content. A lot of the educational sites about how to blog or how to create content — a lot of the sites, a lot of the tutorials — begin and end with this: how to create content that gets people’s attention. If your site is supported primarily by advertising, this might be all of your content. Advertising is a really brutal way to make a living on the web, but if you are a nail polish blogger or you are a Let’s Play Minecraft gaming YouTube channel, it’s probably the model that is the model you have. Whether you’re a nail polish blogger or you are a copyblogger, your content has to capture people’s attention. If we can’t capture attention in the midst of all this noise and all this clutter that people are facing and all this distraction, then we can’t go anywhere else. That’s why it’s always upfront of any copyrighting formula. In fact, last week when we talked about traditional copyrighting tactics, those folks really know how to nail this one, because they’re paying for the right to put their content in front of your eyes. They’re paying for a piece of direct mail or they’re paying for an ad. So headlines, packaging, intriguing ideas — all of these are ways to boost the audience attraction factor for your content. Now, there are a couple of ways you can blow it. One of them is that you can just copycat what somebody else is doing. You can just be kind of a weak version of Buzzfeed, or a weak version of Copyblogger, or a weak version of The Bloggess, or whatever it is. You can be a pale copy of somebody else’s vibrant and interesting work. Another way you can get this wrong is you can be a train wreck. So you can get a lot of attention for being a disaster and a lot of attention for being outrageously foolish. But again, unless you are on a straight advertising model — so you’re somebody like the YouTuber PewDiePie, this is his model. If you’re not on a pure advertising model, where you just get paid if people pay attention to you, the train wreck will not translate into business for you. The third way you can get it wrong is you can stop here. You can stop at gaining attention and say, “Well, I’ve got all this traffic, so my blog is successful.” But it isn’t successful until they start to take the next steps. Right now, I’m going to take a very quick break, but we’ll be right back with Copyblogger FM. And I will let you know about a content type, and obligatory content type if you like, that doesn’t just get the attention, but it is what leads to that next step. I’ll talk to you about that in just a moment after the break. This episode is sponsored by Acuity Scheduling. You know how challenging the back and forth of booking appointments and meetings can be. I don’t know if your email inbox is anything like mine, but sometimes, it can be truly scary. And you can miss out on a client or you can miss out on an important opportunity because you’ve lost track of some crazy, impossible email chain. Would it be kind of awesome if you never had to ask, “What time works for you?” again? Acuity Scheduling makes the whole process of scheduling your appointments so much simpler. It works with your existing Gmail calendar, Office 365 calendar, iCloud, or Outlook. Clients can view your availability and they can self-book their appointments, they can complete onboarding forms, and they can actually even submit payment, so you can get back to doing what you do best. Acuity helps you avoid no-shows with automatic text reminders and email reminders. It’s simple to use, and they offer really phenomenal customer support as well. Go to AcuityScheduling.com/Copyblogger to start booking all of your meetings with zero hassle right now. Now, the paid plans for Acuity start at $10 a month, but Copyblogger FM listeners can get a free 45-day trial of Acuity Scheduling — that’s a month and a half for free — just by using AcuityScheduling.com/Copyblogger when you sign up. Just to repeat, that’s AcuityScheduling.com/Copyblogger. I just want to thank them for their support of this podcast, Copyblogger FM. Sonia Simone: Awesome. Welcome back. We were talking about attention content being what we could call an obligatory form of content. You have to have content on your site that attracts audience attention, or you can’t get anything else to work. If advertising is not your business model — and often, even if advertising is your only business model — you can go further than just attention content with a second kind of content that we like to call authority, the authority content type. This is where you show off your ability to help your audience. This comes in a lot of different forms, so typically, a really robust content strategy will include authority content that is free. You could include content also that is free paywall content, and what that means is you don’t have to exchange any money to get it, but you do have to exchange a valid email address for a digital download. Or something we find tends to work a little bit better, membership to a free site, a library type of site, or an archive, if you will. In some businesses, you have premium content. You have content that exists just for your customers, and that can be content they can pay for. It can be content that is a bonus to something that they paid for, so sometimes the content is the product, and sometimes the content serves the product. Of course, these come at all levels as well. We’ve got entry-level price points, under-$10 kind of price points. We have a bread-and-butter price point. What that is depends on your volume of customers. And then it’s great if we have a premium price point as well. It just depends on your business model. Authority content can serve as attraction content as well. Those two can definitely overlap. You can have audience attraction content that also establishes your authority, and some blogs create a lot of this. Copyblogger creates a lot of this kind of content that serves the dual function. It really depends on your business model. The thing that differentiates this from attention content — attention content is interesting, fascinating, if we’re going to use Sally Hogshead‘s term. Authority content is interesting/fascinating and it’s useful. And it is useful in service of something your audience cares about. Not necessarily something that you think is a priority, but relevance and what’s interesting and what’s useful. Those value judgments come from the audience. You are only there to facilitate that and uncover what they’re going to find useful and interesting. How do we get to interesting? Of course, on Copyblogger, we talk about this almost obsessively. How to create this authority content type, content that is both interesting and useful. But I can give you a few rules of thumb. Authority content becomes interesting, compelling content when it is relevant to my problems as an audience member — when it is addressing something that I am bothered with, bothered by — and it helps give me some solutions and approaches and techniques that I can use to get a handle on the problems that bug me. So, relevant to my problems. The other thing that makes authority content interesting is when the personality and the values of the content resonate with me. Now, this is going to vary. A personality that works for one set of people is going to completely turn off a different set of people. You can have the exact same advice that’s seasoned differently and appeals to vastly different audiences. We see this all the time. And you especially see it in the big topics — business, fitness and weight loss, parenting. It often boils down to very solid core principles — they don’t change that much — but delivered with very different seasoning, different values, different tone, different personality. Content that’s delivered without personality is not what people want, unless it’s the only place they can get it. Unless you’re Wikipedia, it’s just not appealing. It loses out on the interesting factor. It might be useful, but if it’s useful and not interesting, it won’t get consumed and it won’t benefit your business. Finally, authority content is more interesting when it’s packaged to be readily consumable. That’s everything from keeping the language very clean and readable and accessible. It’s about being visually appealing on the page, formatted well on the page. It’s about having a headline that grabs our attention. All of these are about packaging your interesting, useful content to make it just very user friendly and something that people enjoy reading, listening to, watching, what have you. Just like the attention content type, authority content can go wrong. There are some things that you can do that will derail your efforts. The biggest one is to be boring, to just not stand out, to not be creating something that has a strong voice and resonates with some strong opinions, some clearly defined values. You can do it wrong by delivering it to the wrong audience. You’ll especially see this with poorly designed Facebook ads or other social platform ads. If you serve the piece of content to an audience for whom the content is not relevant, it’s not going to do you any good. Arrogant content, in my experience, depending on your audience — there are audiences that will respond to it. Most of the time it falls flat, and you get a lot of people with pins come to poke holes in your pomposity. Of course, inept content. If you’re not good at the topic, it’s going to fall apart. You have to know what you’re talking about, and you have to be able to teach it so that people get a good result from it. Just like the attention content, one of the mistakes people make with the authority content is they stop here. They think, “Well, I have lots of authority. Not only am I getting plenty of traffic, but people really recognize that I know what I’m talking about on this topic, and I’m helping people.” And content creators think they’re done. But there is another obligatory element, and if you don’t have it, your business is not going to do what it ought to do. That element is action, getting the audience to do the thing they’re here to do. Also known as ‘the whole selling part.’ If you establish plenty of traffic because you’ve got good attraction content and you’re delivering it well, you might be using some social platform advertising, or you might have a strong SEO presence. You’ve got lots of traffic, and that traffic believes that you know what you’re talking about — you’ve delivered your content with authority. If you just wait around for people at this point to ask to give you money, it’s going to be a really long wait. We come to the action portion of our content strategy, of our obligatory content elements. This element of content marketing and copyrighting, it’s very much a craft rather than an art. I would say 80 percent craft, 20 percent art. There is a certain art to it, but it’s very learnable, and it’s very much based on techniques and best practices and testing. So things like your call to action, all of your copyrighting and conversion techniques, conversion psychology. And most important of all, seeing what works and doing more of that and less of what doesn’t work. Action — this step, this obligatory content type — works a lot better when you put it in the right context. The right context is that context of authority and sustained attention. So not only have you captured their attention in the first place, but you have sustained it over time, which is one of the reasons why that authority content has to be interesting. Action content is very much about copyrighting technique. We do have lots and lots of materials for you. If you go to the show notes, I will give you some links to some of those. And just like we did before, there are some ways that it goes wrong. Looking through this, I found four deadly ‘I’s. These are not the kind of eyes that look at you. These are the kind of ‘I’s that are a capital letter. The first one is ‘incongruent.’ And this often happens when you’re not comfortable with selling, which is you have a certain kind of a tone, a certain set of values when you’re establishing authority. And then it goes out the window and you turn into ShamWow guy when it comes time for your sales page. Sometimes this is because you hired somebody, and that person did not take the extra step of making the tone congruent with your other content. Sometimes it just happens because you’re nervous and you’re putting on something that doesn’t feel natural to you. But either way, if your action content is not aligned with the rest of your content, you’re going to create a trust problem. Because it just feels like you’re pulling the rug out from people. Any time you have a trust problem, you will not get the result you are looking for. People will not sign up to be on your email list, they will not buy the product. They will not become your client and work with you. They will not eat the vegetables you want them to eat, or take the action that you want them to take. The flip side of the first deadly ‘I’ — the second deadly ‘I’ is ‘ineffective action content’ or wimpy action content. This also comes when you’re uncomfortable with selling. You’re so worried about being too salesy that you’re just a complete marshmallow, and you do this kind of scuffling your foot on the ground and saying, “I don’t know, I have a thing. It’s OK if you want it. If you don’t want it, I totally understand why. And I don’t want to pressure you, but whatever, it’s there if you’re into it.” At this point, it doesn’t sound like you believe in your own solution. You have to convey that you actually believe in the thing that you’re asking people to do. If you’re that insecure about it, then you’re making it sound like it isn’t very good. We have to find that balance. The third deadly ‘I’ is ‘illogical,’ and that just means that you haven’t made your case. You haven’t presented enough evidence. You haven’t given us enough benefits and features. You haven’t explained the solution clearly enough so that the person can visualize it. You haven’t really made the persuasion case yet. A lot of people will come to this point because they’re trying to make their sales material short, and short does not work if people have incomplete information. It has to be logical. The case has to follow. You can format it so it’s easy to skim, so the person can find the information they care about. But you have to make the entire case so people have all the evidence they need to make that decision to move forward. The final deadly ‘I’ is probably the most dangerous, which is that the offer is ‘irrelevant.’ This is the wrong offer for this person. I say that it’s dangerous only in that it’s almost impossible for you to sell something to somebody if that offer is not right for them. If it doesn’t solve a problem they care about — if they are a Taco Bell consumer and you are offering a premium steakhouse price point — it ain’t going to happen. It’s not the right offer for them. It’s not what they’re looking for, and whether they can or they can’t is not relevant. They won’t. You have to be sure you’re making the right offer for the right person. And in a lot of businesses, we have offerings that are good for some segments of our audience and not for others, and a lot of businesses will have multiple products because we have different people who come to us at different places. And that’s totally cool. It doesn’t mean that an irrelevant offer is bad. It just is not the right fit for that particular person. It might be highly relevant and useful for somebody else. But of course, if it’s not relevant for anybody, you’re not going to sell anything, which is a bummer. Those are three — I would say three and a half, if we include the About page — obligatory content types. Three As, three and a half As. Now, as it happens, we have seven As. We have a free ebook written by Brian Clark, who is the founder of Copyblogger. He is our CEO at Rainmaker Digital. And he put together a content marketing strategy. In fact, the book is called A Content Marketing Strategy That Works. It really creates not only these three As — and he talks about them from his point of view, and he also offers some checklists and some things that you can go through, some exercises. He also includes the context, because if these obligatory content types are not put in the right context, they will not tend to be as effective as you want them to be. You can download that for free over at My Copyblogger. You can always find that at Copyblogger.com. Just look for the education section that says “Free My Copyblogger.” Get signed up for that. You get instant access to a massive content marketing library, and I’ll give you a direct link to that ebook. That’s it for today. I hope that this was useful to you. I would love to hear about how you are using these content types on your site. If you are into it, why don’t you drop me one link, or you can totally do three links, that’s cool with me, in the comments of this episode over at Copyblogger.FM. Let me know is this action content, is this authority content, or is it attention content. Or is it a blend of two or three of the elements. I would just be really curious to see how this looks in your business. I always like to look at this stuff. I’m a giant geek for this kind of material. Hope this has been useful to you, and I would love to see you in the comments. Catch you there.